Planning a marathon could be an enjoyable and rewarding experience for many people. It is truly a different experience altogether. However, it is not just the way it seems to be. A lot of effort and planning goes into making a marathon event successful and highly enjoyable for all the participants. Your runners might not know the work involved and efforts that you need to take, to make this event a successful one. Therefore, there are some tips, which could help you change the game of your marathon planning. If you are planning a marathon for the first time, then these steps will guide you, and will bring a shift in the level of your marathon! Let's go running with these tips. Everything has become digital today. The world relies on technology, and relies on technology, and expects the technology to the most of the work. Instead of handing out registration forms, create an online registration form. This will make the task easier for you as a planner, and also for the participants as a runner. This online registration planning and the process does not only make everything easy, but it also increases the engagement and the rate of participation. Choose your online registration forms wisely. You could make use of Google forms. ‘Google forms' is a very functional and an easy form to fill out. You can mail out these forms, or you can even share them on Whatsapp. The easier it is to share the registration forms on social media platforms, the more visibility your marathon will get. Alternatively, else, when you are picking out a different online registration form provider, choose a design that has a simple check out process. The design should be such that the runners do not have to create an account of their own, and they can simply fill out the form and check out. Your running location should be something which is very easily accessible and within everyone's reach. You should organise it in such a location, where runners get some really good space to run, and the terrain is smooth and does not has any puddles or potholes. Depending on the size of your race, you must also see how many food stalls and water stalls can be accommodated nearby or along the race track. This is very important, as the runners will need hydration and they will also need to feed themselves in small intervals. Therefore, you need to look out for spaces to accommodate these stalls. Also, take prior permission for organising the marathon on the chosen location. Events like these require prior permission; therefore keep in mind to ask for it, to avoid any last moment hassles. Choosing a good race course is a very important aspect. Your race course should give a satisfying experience to your runners. Moreover, the race course plays a major role in giving such a unique experience to your runners. Therefore, the terrain determines a good race course. You must look after the path, where there are fine downhill, and if your marathon is a challenging one, then you could look for paths that have some gentle uphill too. Runners generally prefer a route that is flat or has a gentle downhill. Therefore, if you want more and more people to participant in your marathon, then you must go with what the majority would like to have. You must avoid keeping uphill and stick to flat and downhill routes. If you want to cut down on expenses, then you can avoid having long single way routes. As they also require transportation facilities and charges for the runners. Therefore you could set an out-and-back or a loop race course. You could organise a run for fun, or a run for a charitable cause. Both of them partly have the same kind of effect and influence on the people. Run for fun has become famous in the recent time. Recently people have been giving much importance to health, and they find such once in awhile activities thrilling and extremely fun. 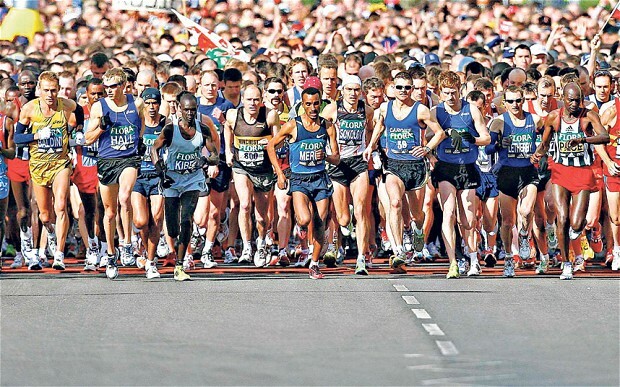 Such marathons have become trending, and therefore you could expect participation in masses. In the same way, run for charity also attracts people a lot. Run for a cause, makes people join the marathon, who would not have otherwise considered joining it. Also, if you decide on setting up a certain theme, then you must also keep in mind the expenses that come along with it. If you want to involve a charity, then you must approach many charities well in advance, as they can potentially help you in volunteering and promoting your event as well. The advertisement is a sector, which can boost up any organisation, event or business. It is a very powerful area, and you could make some good use of it. Today social media has a big reach on the masses, and it increases your visibility in the crowd. Therefore, you could make good use of social media to advertise and promote your marathon. You could make banners of your marathon and stick them on the hoardings nearby the chosen marathon location. You could also make pamphlets and hand them out to a newspaper provider. Make sure to advertise your race on Instagram and Facebook as they have a global outreach.